When Will, head of business development for FoodDigger, emailed me asking if I'd be interested in dining at the new Fraiche, I jumped at the chance, especially given all the hoopla that's been surrounding the restaurant as of late. 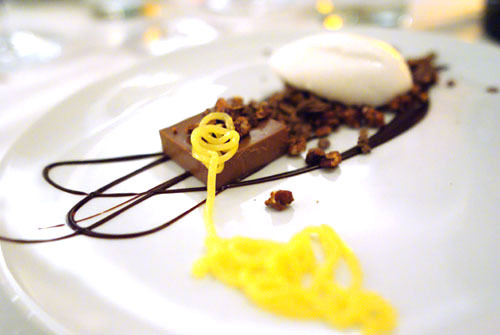 Despite being billed as a "mini" TastEvent, the dinner was anything but, with a special eight-course tasting menu prepared by the chef for us. Joining me were Marshal and Will from FoodDigger of course, as well as Caroline of Caroline on Crack, Esther of e*star LA, Julie of LAist, Lindsay of LAist, Maya of ShopEatSleep, and Ryan of Only Eat What Feeds Your Soul. And by the way, the Fraiche frenzy didn't stop here; apparently, FoodDigger also sponsored a dinner a week later on the 9th, this time at the original Culver City location. 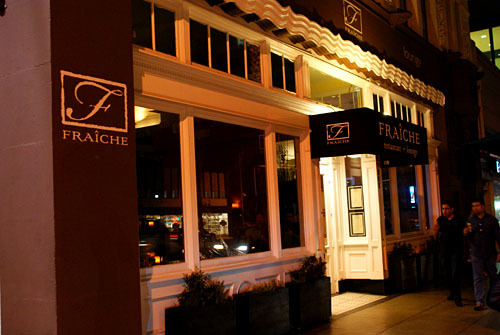 A brief history lesson: Fraiche was opened in 2007 by a quartet of partners: Keith Fox, Amir Ohebsion, Thierry Perez, and of course, chef Jason Travi. The Massachusetts-raised Travi hails from a long line of restaurateurs, and started in the industry as a dishwasher at age 15, eventually working his way up to a line cook position. Afterwards, he enrolled at the CIA, graduating in 1997. Travi then made the move to sunny Southern California, taking a sous chef role at Wolfgang Puck's Granita, under the endearingly-named Jennifer Naylor. 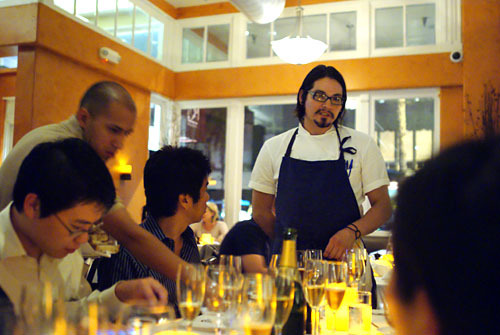 He then worked at Joe's in Venice before taking on another sous chef gig at Spago in 2000, under Lee Hefter. 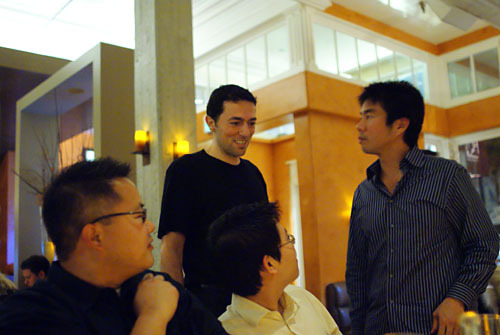 It was at Spago where Travi met his future wife, Miho, who would eventually serve as Fraiche's pastry chef (she worked under the legendary Sherry Yard at Spago, and under Michelle Myers at Sona). Travi's next move was to Opaline, where he was executive chef; the next year, he jumped to La Terza, where we helmed the kitchens for Gino Angelini (Miho moved here around the same time). Shortly before deciding to open Fraiche, Travi staged at Al Cavallino Bianco in northern Italy, where he learned the art of salumi, the Italian process for curing meats. At Fraiche, Travi's vision was to put forth a menu of French and Italian fare, emphasizing local, seasonal ingredients and rustic preparations, utilizing all that he'd learned over the years. For the most part, he was successful, and Fraiche quickly became one of LA's most popular restaurants. 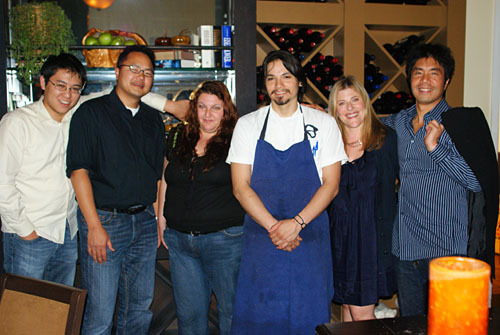 Travi and his partners capitalized on this success, and opened the appropriately-named Riva ("shoreline" in Italian), an Italian small plates/stuzzichini joint (with pizza, at one point), near the beach in Santa Monica in 2008. All seemed to be going well, until early this year. In April, co-owner Thierry Perez dropped out of the partnership in order to open his own restaurant nearby, the unfortunately-named Ben Fatto ("well done" in Italian), apparently taking over the space of the Crest House Family Restaurant. The other shoe fell in October, when it was announced that Riva would close, to be replaced by Fraiche II on October 14th. At the same time, it was discovered that Jason and Miho hadn't been involved with the restaurants for some time, and were on a multi-month "sabbatical," returning in December (brought about by the birth of the couple's first child, officially). The company line was that the two were working on a "consulting" basis. However, in late October, word came out that the Travis were going to open up their own restaurant, somewhere in LA (but not in Culver City or Santa Monica). Apparently, Travi has the financial backing in place for his own venture, but according to Fraiche 2.0 management, he still retains an interest in the Fraiche franchise. And so here we are today. With both Travis out of the picture, Elderoy Arendse is now the Chef de Cuisine at Fraiche Culver City, with Sydney Charles Hunter III taking over the same position in Santa Monica. The pastry department for both restaurants in headed by John Park, whom we last met at Water Grill. The front of the house, meanwhile, is under the direction of Maître d' Catherine Stratton, while Iain Walling fills that role in Culver City. 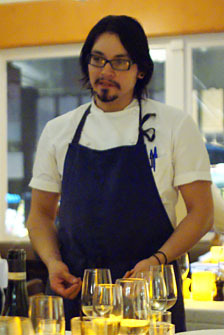 Walling also acts as Wine Director for both restaurants; he comes to Fraiche from Saddle Peak Lodge (in fact, he was responsible for promoting their current Chef de Cuisine Adam Horton). Finally, Bruno Bagbeni is the General Manager, overseeing both locations. Unfortunately, I never had the chance to dine here when the space was Riva, so I can't really tell exactly what has been done to the interior since the switcheroo. Looking at old photos of Riva, however, it does look like the room has been gussied up a bit, with swaths of fresh paint at the very least. In any case, it is a fairly large dining room, with a bar to the right as you enter, a chef's counter in the back, and a semi-private room off to the side. Lighting is dim and challenging, with photos being shot at around ISO1600, 1/8s, f/2. 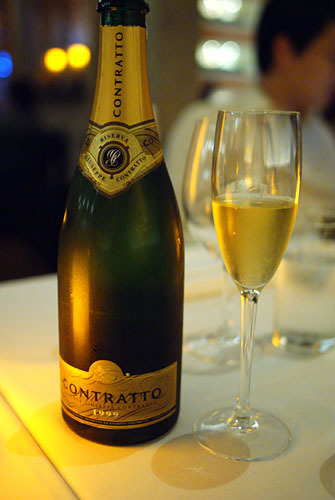 Upon being seated, I was given a glass of sparkling wine as a sort of apéritif, specifically the 1999 Giuseppe Contratto Asti Spumante Classico Riserva. It was remarkably different than any other Asti I've had, being notably dry, with a marked toasty character not unlike that of a fine vintage Champagne. 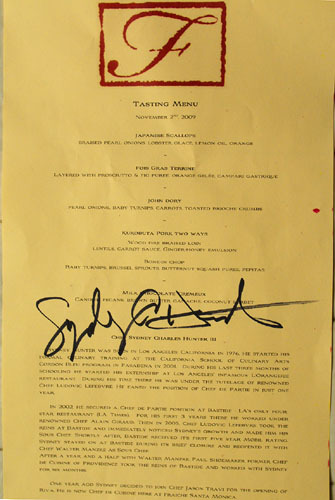 Above, we see the custom menu created for this FoodDigger dinner; click for a larger version. 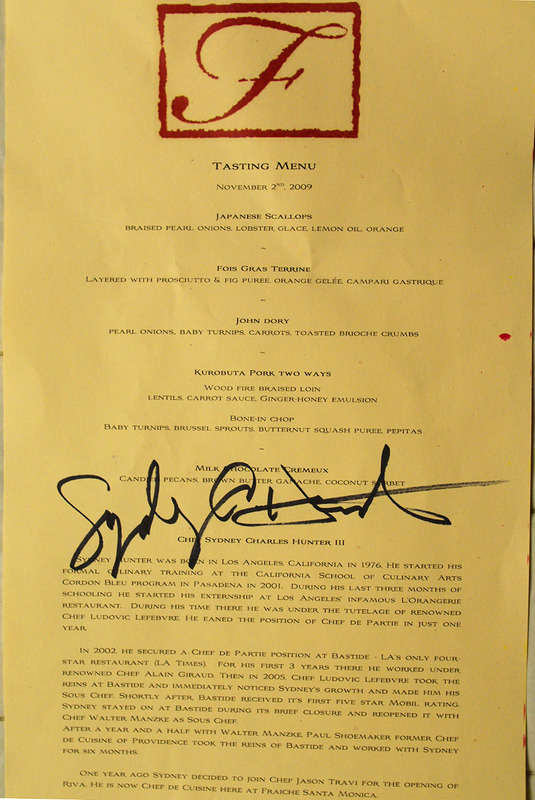 It is not complete, however, as the chef surprised us with two spontaneous courses (see below). Nor does it list the superb wine pairings provided by Iain Walling. Before the meal began, Chef de Cuisine Sydney Hunter III came out to say a few words about the restaurant and the menu that he'd prepared. Hunter started at Riva in 2008 as an opening Sous Chef, and subsequently was promoted to Chef de Cuisine after the switchover to Fraiche. Born in Los Angeles in 1976, Chef Hunter began his culinary education in 2001, at the California School of Culinary Arts Le Cordon Bleu program in Pasadena. During his tenure there, he started an externship at the legendary L'Orangerie restaurant, working under none other than Ludovic Lefebvre (notice the similar haircuts). In 2002, Hunter secured a chef de partie position at the infamous Bastide, then helmed by Alain Giraud (who went on to open Anisette). 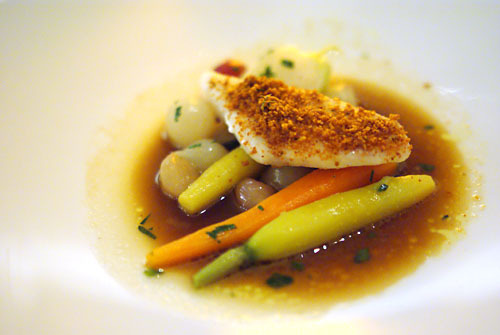 In July 2004, Lefebvre took over the kitchens at Bastide, and thus Hunter was reunited with his former boss; Ludo subsequently promoted him to sous chef. 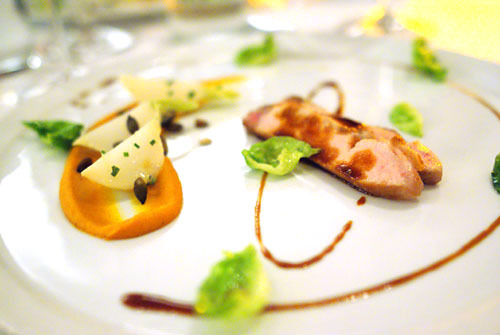 The restaurant closed in January 2006, only to reopen in September 2007 under the watch of Walter Manzke (who's now at Church & State, of course); Hunter would again join the Bastide team as sous chef. When Providence alum Paul Shoemaker (anyone know what he's up to?) replaced Manzke in May 2008, Hunter was there yet again, up until the restaurant closed, once more, in November 2008. 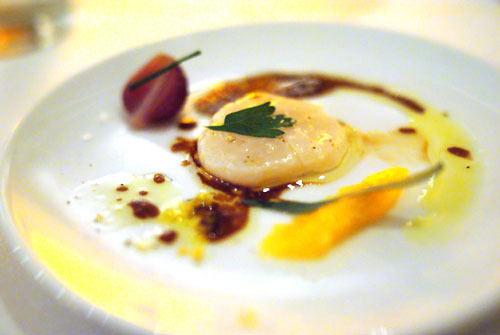 Upon consuming this bit of scallop, I knew that we were in for a special meal. There was a fascinating interplay of sweet, sour, and savory flavors going on here, creating a certain level of refinement that took me by surprise. However, I would've liked a more substantial, possibly thicker piece of scallop here, in order to better highlight the bivalve's natural brininess and subtle sweetness. 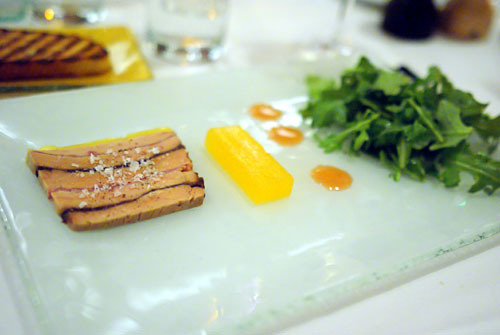 Taken alone, the foie gras demonstrated a sweet, jammy attack, which gradually gave way to the liver's rich essence, closing with a lingering savoriness--it was pretty good. However, to take things to the next level, I had to eat everything on the plate together. The sugariness of the gastrique, the sourness of the gelée, the tempering element of the brioche, and most importantly, the marked bitterness of the arugula--all these elements combined beautifully, offsetting and complementing each other, forming a near perfect amalgam in my mouth. 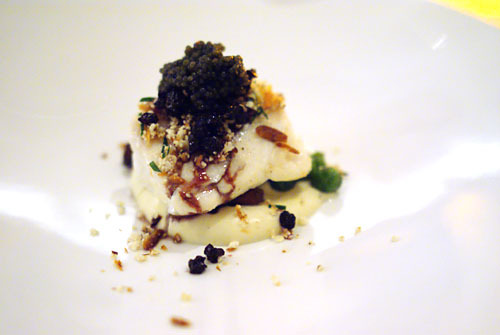 Chef Hunter would later reveal that the dish was, in a way, inspired by his time working for Ludo, who encouraged him to experiment with new and inventive flavor combinations. 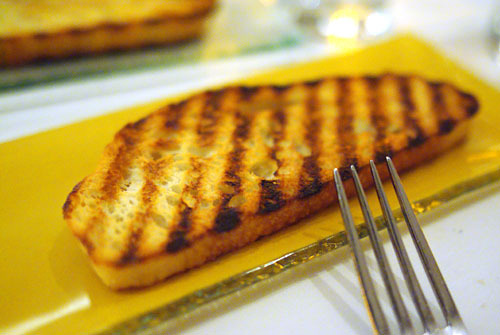 Will even remarked that he was able to "taste" Ludo in the terrine (personally, I thought Ludo would taste saltier!). Somewhat surprisingly for Dory, the fish's flesh was actually very subtle on its own, and was nicely accented by the bitterness of its crunchy brioche crumb "crust." The key to this course, though, were the vegetables. They were absolutely integral, and provided a great depth of flavor, a fantastic heartiness, a much-needed weight to the fish. And now, a brief visit from Amir Ohebsion, co-owner and president of Fraiche Management Group. Outside of Fraiche, the Berkeley- and UCLA-trained Ohebsion is an attorney at his own law firm, specializing in corporate and M&A law. Our first spontaneous course, this was a beautifully cooked piece of fish, with an uncommonly heavy, dense, meaty consistency that was a bit surprising for halibut (some of us even thought that it might've been done sous vide). The flavor was very mild, delicate even, and was deftly augmented by the briny tinge of caviar and the vegetal tang of the peas, while the mushrooms added a certain gravity to the dish. Quite nice. And now, our second surprise. It's been a while since I've had a good rabbit, so I really appreciated this course. 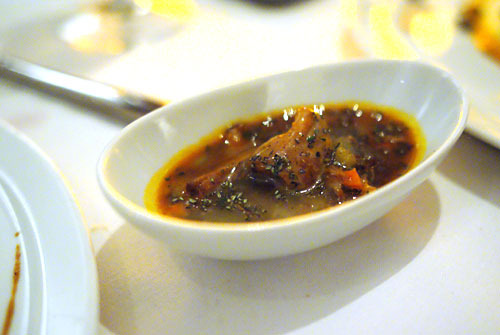 My favorite of the troika was the confit, melt-in-your-mouth tender and intensely flavored with a touch of rabbit-y gaminess. The saddle, meanwhile, had a great, supple texture and a milder flavor backed by a wondrous herbal finish; it was excellent with the sauce, which itself was flavored with rabbit entrails. Finally, we have the rack, the fattiest, most unctuous part I'd say, with a lipsmackingly luscious flavor. 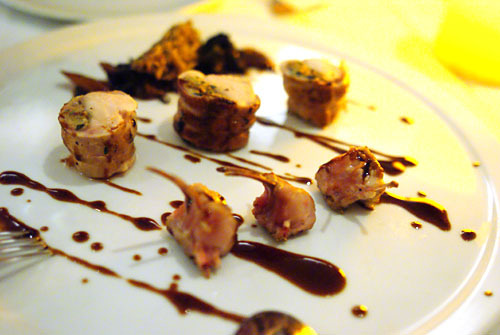 Returning to the printed menu, here we have our first part of the pork duet. The meat itself was braised to tender perfection, and smothered in a delectable sweet/spicy sauce that almost recalled a Chinese-style preparation. The carrots added a rustic element into the fray, while the lentils proved a superb, earthy complement to the decadence of the pork. Half the table asked for a second serving of this! The other part of the pork pair couldn't have been more different. The meat here was only slightly less tender than the braised version, but its sapor was much more subtle. I loved how it was balanced by the light, bright flavors of the Brussels sprouts and the bitterness of the turnips, as well as the smokiness imparted by the pepitas (roasted pumpkin seeds). My only quibble was with the squash, with I felt was a touch too sweet for the pork. And now, the sweet ending. The three main flavor components here--the decadent sugariness of the chocolate, the coolness of the coconut, the fruitiness of the "noodles"--all went together superbly here, creating a opulent, yet balanced commixture elevated even further by the textural contrast provided by the pecans. After dinner, we were given a tour of the kitchen by Chef Hunter. 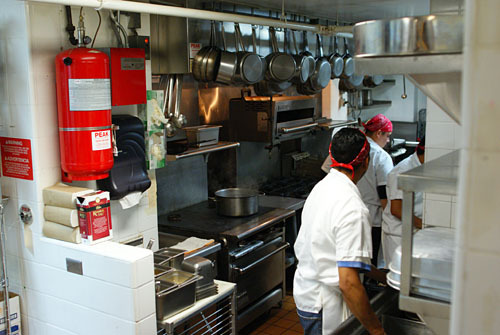 Fraiche's kitchen is divided into two areas. Above, we see the outer section, which includes the pizza oven. It'll be interesting to see what the restaurant will create in there, given that pizzas are no longer on the menu. We then made our way into the kitchen's inner sanctum, sort of a long, narrow space that connects to the semi-private dining room. And here were are in said dining room, posing for the requisite group photo with Chef Hunter. That's Ryan, Will, Lindsay, Sydney Hunter III, Julie, and Marshal. The others had left by this point, with Esther taking off especially early due to her sick cat Rufus. When I heard about this TastEvent, the first thing I did was check out the menu for Fraiche Culver City. What I saw online consisted of somewhat bistro-inspired fare, with a nice selection of pasta, and a great spread of charcuterie--straightforward, good food. However, what I ate on this night was really a notch up in terms of refinement, flair, and panache, a nod to Chef Hunter's time spent at Bastide perhaps. Fraiche la seconde may have started with a base of the original's menu, but it looks like Hunter has had some leeway in adding his own unique touches, his flourishes to the carte, which sounds like good news to me. I think he'll do fine, with or without Travi. To see Will's recap of the meal, check out the FoodDigger blog. BUT DANG... on the other hand, I do want to try the Rabbit Three Ways! Bruno Bagbeni is the general manager of both Fraiche in Culver City and santa Monica. Iain Walling is the wine director for both locations as well as a Maitre'd in Culver City. Catherine Stratton is Maitre'd in Santa Monica. Jo: I just checked out your Riva post--pizza looks good! I wonder, could the oven be used to make tarte flambées/flammekueche? Esther: Great seeing you too! It was too bad you had to leave early. :( At least Rufus is doing better. Anon: Thanks for the corrections; I've made the updates. Didn't know about all the Fraiche management shifting. I got bored of the Culver City location long ago. Definitely doesn't look like a "mini" tasting considering how heavy all the courses looked.